I'm looking for ideas on how to convert my 300 to fuel injection. The year before last, I built up a 300 and dropped it into my '81 Bronco. It currently has an Offenhauser intake with a 450cfm QuickFuel and EFI exhaust manifolds. Then, late last year, my '81 was rear ended and "totaled". I'm still driving it, but it'll never be what it once was. So, I purchased a nice '85 Eddie Bauer Bronco with a fuel injected 302 in it. I plan on dropping the 300 into the '85 and fuel injecting it. Plus some other goodies like roller rockers, screw in rocker studs, etc. Either way, as far as I know, it's modified way too far beyond stock to use the stock EFI system. My initial idea was to simply get one of the self learning TBI setups and bolt it on. However, I've been toying with the idea of MPFI and a controller of some sort (I'm assuming MegaSquirt). I haven't done much with fuel injection, so I don't have ANY experience with setting it up. But, I've been working on engines for a good 10 years, and have been programming computers for almost twice as long and am a software engineer by trade, so I don't think I'll have too many issues with things. Any advice on which route to go? What the pros and cons of each are? The price of the TBI units have come down so much that it almost seems like those would be considerably less expensive. But, I'm liking the idea of the MPFI the more I think about it. This is a daily driver 365 days of the year and I take it out camping in the middle of nowhere, so reliability is a big concern. And getting the most out of my built engine would be fun too. There are only two aluminum intake manifolds available and you own one of them. 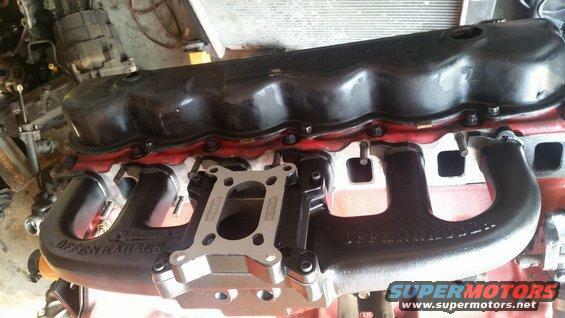 The other is the lower half of the stock 4.9 EFI manifold. You could weld the injector bungs to your Offenhauser intake runners and use an Edelbrock 90 degree throttle body adapter with something like a 70mm throttle body. The stock EFI lower half has the injector bungs and would need a plenum fabricated to accommodate a throttle body. Thanks for the reply. I don't have much in the way of fabrication tools, so anything/everything I did that required welding, cutting, etc. would need to be farmed out, which would add up. Drilling and tapping injectors into an Offenhauser intake did seem like an intriguing middle option since that's about all I could do myself. The stock system is already set up for this engine, so I'd more than likely go that route (if I did) and then modify it. However, I'm mostly curious about the pros and cons of each system. I like the idea of the self learning TBI because I can just bolt it in place of the carburetor and set it up. There's a lot to be said about that. Plus, hey, self tuning. Then MPFI obviously has its benefits. But what are we talking about? 5 more horse? 25? Better gas mileage? Just smoother throttle? If the gains of going to MPFI aren't significant, I'll go with the bolt on TFI. But if it's major, I'd like to know the performance difference and if it's worth the extra work. Just looking to get some insight. There are several advantages to MPFI. 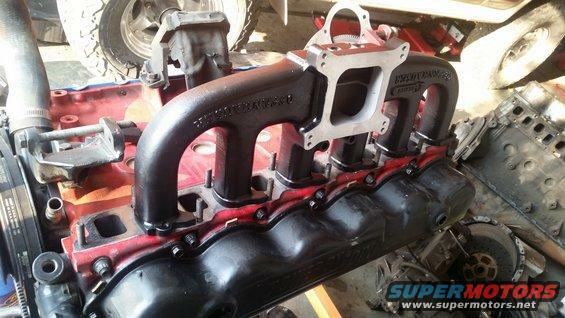 The main advantage is that there are no restrictions to intake manifold design. 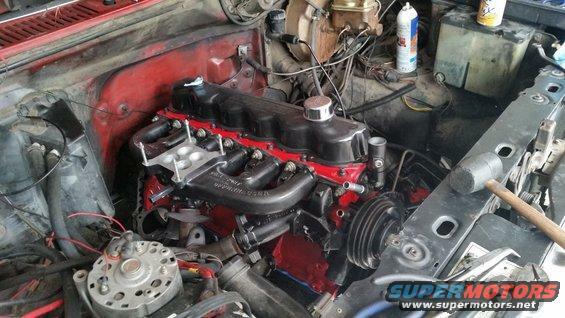 The second is that the intake manifold can always be run cold. In your case where the most economic choice is to use what you have and not get involved with a lot of fabrication, MPFI won't offer any noticable gain over TBI. Heating the manifold in cold weather conditions may still help but systems like FiTech that use annular discharge below the throttle plates perform better with cold intake manifolds. That's what I was curious about. I know MPFI is better, but if it's not worth the extra effort, then I'd rather focus on a good TBI unit. If that's the case, I suppose it comes down to which one. I see there are mostly 4bbl design TBI units, and a few 2bbl ones. I know with a carburetor what the differences are but when it comes to TBI, does it really matter? Is it simply a matter of what fits on your intake? If a 2bbl TBI supports up to 350hp (which I wager is plenty for my engine), are there ANY drawbacks to it vs. a 4bbl design? The FiTech setups look good but I've read over and over again that their tech support is poor (and rude), and I'd rather not deal with that. AbandonedBronco wrote: If that's the case, I suppose it comes down to which one. TBI injects the fuel so there is no progressive linkage like on a 4 bbl carb or some 2 bbl carbs where a high venturi velocity is needed at low engine rpm. All the 2 or 4 bbl TBI throttle plates open together so it is just a matter which TBI supports the HP you need. One: If you use a TBI the has a much larger HP and airflow rating than your engine needs, the throttle responce gets touchy and hard to control part throttle since the throttle body can reach full engine power at less half the throttle opening. It is better to use a TBI sized so you get to use close to all of it's throttle range. Two: Injectors have a minimum response time usually around 1 ms for a pintle type injector. If the injector size is large enough so that the injector pulse width from the ECU is close the the minimum responce time for idle or low speed engine operation, the fuel flow to pulse width relationship is no longer linear and fuel control is lost. If you only need two 100 lb injectors for full power then using four 100 lb injecors cuts the pulse width to each injector in half for the same total fuel flow requirement and operates each of the four injectors at the lower half of their responce curve. Similar to the throttle body size situation, The ECU has better control of an injector if it can use more of the dynamic range of the injector and without having to drive the injector near either end of the response curve where the response becomes non-linear. PMuller, thank you for this great information. It's exactly what I was needing, and it makes a lot of sense. It also greatly helps me make a much more educated decision. The one I'm working through now is whether it's better to have 4x50lb injectors or 2x100lb. Or is it six of one, half a dozen of another? 4x56lb injectors. Rated up to 400hp. 2x100lb injectors. Rated up to 350hp. 4x66 lb injectors. Rated up to 500hp. The Summit system is nicely priced, and in their Q/A section, someone else asked if it would work on a stock Ford 300, and they said it'd work great, so I don't imagine I'd have any issues on one like mine. But... Overall, it's looking like the 2bbl style Holley TBI is the best bet. Even though the FiTech 30003 is rated at 400 hp, the 4 bbl throttle body flows 900 cfm making the flow capacity twice as much as you need. The FiTech 39001 two bbl is also rated at 400 hp but it only has a 450 cfm flow rate and you will like the throttle control much better. The Holley 550-850 is also a good choice. It has ignition timing control and the ECU mounts on the throttle body. The FiTech does not have timing control and I believe the 2 bbl version's ECU mounts externally from the TB unlike the rest of the Fitech 4 bbl TBIs. That needs to be verified. The Summit 240500 is larger than what you need. Again, excellent info. Thank you! I saw the FiTech 39001, but could find very little info on it. Even their own site has a lot less details for it than they do for their other setups. I also wish they had a black version, as my entire engine is a red/black theme, including my current QF carb. The gold would be awkward. Not that that's a deal breaker, but it's a factor. I have no delusions of ever approaching 300hp with this motor, so there's no point in getting anything bigger than I need. Looks like the 2bbl TBI setup will do great. And yes, no matter which I go with, I'll be getting a different intake. Even a 4bbl TBI would be screwed up by the DP and its two different sized passageways. pmuller9 wrote: Even though the FiTech 30003 is rated at 400 hp, the 4 bbl throttle body flows 900 cfm making the flow capacity twice as much as you need. I'm not sure where you got the info that the FITech EFI TBI injects below the throttle plates, but it does not. They all inject through an annular discharge ring right above the plates. Their slow motion YouTube videos show it along with the sequential injection sequence that allows idling a smaller engine without any low pulsewidth injector issues. From what I've seen, I would lean towards the Holley over the Fitech, just from initial quality and tech support. The main issues I see from the Holley are installs with EMI or dirty power. AbandonedBronco wrote: Again, excellent info. Thank you! Either 4bbl TBI units work fine with dual plane intakes, other than some complaints of the high pitched whistle from the IAC. An open spacer quiets the whistle and would help any distribution issues you might be worried about, but with the Offy not being a true dual plane and all 4 bores opening simultaneously, I don't see a real benifit of running the DP like a true dual plane a la V8. guhfluh wrote: I'm not sure where you got the info that the FITech EFI TBI injects below the throttle plates, but it does not. They all inject through an annular discharge ring right above the plates. Their slow motion YouTube videos show it along with the sequential injection sequence that allows idling a smaller engine without any low pulsewidth injector issues. The amazing part is, not only have I seen the video before but have physically looked over several of the different models. Someone must have hit me with the "Stupid Stick" at the time. For some reason, I thought I remembered reading something about that on their website, but I can't find it now. Maybe I read what pmuller said and then misinterpreted based on that. Either way, I won't be going with FiTech. Twice now I've emailed them for a product recommendation for which one to buy, and they've never bothered to write me back. If they can't even take the time to write back to sell something, I can't even imagine how tech support is. I don't plan on staying with the Dual Port intake with the TB setup. That design has nothing in common with the V8 dual plane system is 100% designed with primaries and secondaries in mind. If I used a spacer, that'd definitely help with the distribution, but then the divider that runs down the middle of all the runners would only impede airflow. So, the only advantage I can see to using it is... I already have it. I think I'll just plan on selling it and buying an open plenum and just chalking up the monetary loss to the EFI conversion. Not that it matters for this discussion, but it is the Holley Terminator EFI 4bbl Throttle Body Fuel Injection System that has the annular discharge fuel ring under the throttle plates. It's too bad about the lack of responce from FiTech. Late to the party, but if you are dead set on TBI, consider one of the Holley Commander 950 systems (if you can find one, they've been discontinued). These use a staged throttle body that would work perfect with an Offy DP. I think the replacement is the Holley Terminator, which appears to use the same type of staged throttle body by looking at the images. Holley Terminators are self-learning, Commander 950's are not. I ran a Megasquirt 1 v3.0 on my pickup for a while because of the Comp cam. 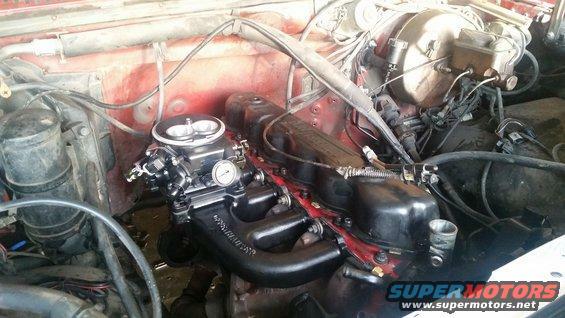 M/S works great with the stock EFI intake and 24lb/hr injectors. Something else I wanted to try but never got around to it, scrounge a CFI throttle body of an '80's C-Vic, swap the two injectors for high impedance units, and run it with a M/S on an Offy C with a 2-4 bbl adapter (CFI bolt pattern matches 2bbl Holley). Thanks for the ideas, MechRick. I was able to trade my Offy DP straight up for a Offy C, so that part is good to go. I think at this point, I'm pretty set on the TBI idea. I never had issues with how carbs performed, I just had issues with cold weather operation, keeping them tuned, trying to get my throttle response crisp, etc. So, a "self tuning carburetor" is honestly good enough for me. I know there are a number of good units out there that I could hunt down and retrofit, but at this point, the Holley Snipers are so decently priced ($899 for about everything I need), it's hard not to go with them. Plus.... having a warranty is nice. However, I'm always open to other ideas. Did you decide which way to go? I just pulled the Bronco into the garage (literally about 5 minutes ago) to start the conversion to that (almost) exact kit. Only difference is that it currently has a fuel injected 302 in it, so it'll be some time before I get my 300 in it. Also, it already has the high pressure fuel system, so I don't have to worry about that part. I'll be getting the 550-850. Otherwise, hopefully in a few weeks, I'll have it up and running with the Holley Sniper setup. Cool . Good luck, and please update when you can. I have a carbed '82, so I'm hoping the Holley kit is "all inclusive". I bought all the stuff to rebuild/refurbish my 390 ( again). It should be good to go for a while, but I'm seriously thinking about making the EFI jump. That's what happens when you retire, and have to much time (and almost just enough money) on your hands. I finished my install. I went with the Holley Sniper EFI kit 550-850. There's more previously on the Bronco, but the swap/install starts around page 10. One thing I had going for me was that the Bronco was already fuel injected, so I didn't need the full kit. I was able to reuse the stock EFI fuel system, which made my job a lot easier. I swapped out my Offenhauser DP for an Offenhauser C, since the EFI would probably get messed up by the dual port intake setup. The 550 kit is also a 2bbl 2300 style, so I used an adapter plate. My review is a total "two thumbs up" A+. I really, really like it and will never reinstall a carb except as a last resort. Aside from some mistakes on my end (like the distributor in 180° out) it fired up immediately and, even after doing any self learning, drove better than any carb I've ever had on the engine. Snappy throttle, smooth idle, and easy to work with. It's a delight to drive. very nice, and the right color too! I'm jumping over to read ur thread on FSB. I see you have not upgraded to a ford 3 g alternator. is this upgrade on ur radar screen? we inhabit similar geographical regions, a hi output alt is security in spades. Yes, I was willing to pay the extra $50 for the black one so it would match, and I'm glad I did. It looks amazing. I haven't upgraded to a 3G alternator. I know a lot of people do, but I guess I never really understood the reasoning behind it. I figured it was if you were adding other power drawing things, like e-fans, a big sub, light bars, etc. What would be the benefit for me? 'Not sure on the 3G. The Holley looks very nice! It's an inspiration - a trustworthy testimony to everything I've read about them. I’m going with the AEM Infinity 308 (PN 30-7113) ECU. On sale for about the same price as MS3X. It has a lot of features for the price. It will be fully sequential inj and spark with LS coil near plug. Has anyone else used the AEM Infinity ECU?